Tuesday night began the championship series for the Madison Memorial track and field team with the City Championships. Over the next couple weeks our team will see how our hard work has paid off as we compare ourselves against some of the best talent in the area and the state. Each meet we look to compete well as a team and end our season on a solid note. Tuesday night started with great performances by both the girls and boys teams. The girls team finished in third place with a team total of 72 1/3 points and the boys team finished in second place with a team total of 87 points. Both teams were competitive throughout the night and are only a few events away from returning to being city champions again. Individually on the girls side the following girls were 2012 Madison City Champions: Marissa H - 100m dash, Hannah L - 400m dash, and Corinne F - Discus. Individually on the boys side the following boys were 2012 Madison City Champions - Daurice F - 110m and 300m hurdles, Blake T-J - Pole Vault, Cameron N - discus. 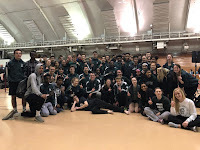 Additionally, the girls 4 x 200m relay team of Rachel B, McKenna G, Marissa H, and Anna H and the boys 4 x 200m relay team of Alex K, Jon W, JaVaughn S, and Jester W added relay champions to our team effort. Overall the girls and boys competed well at the city competiton. Athletes finishing in the top 5 scored at Tuesday's meet. Next week at Conference the top 8 athletes score, it will be important that every athlete competes for every point in every event. Competitors representing the team at JV/Frosh City and next week at Frosh/Soph Conference will set the tone for what is in store for our team in the coming years. Lets be ready to compete!